The province of Bocas del Toro is located in the Caribbean of Panama, to the west of the country. Bocas del Toro is mostly covered by jungle and virgin forests and it can be described as a land of contrasts. 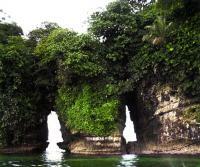 The archipelago of Bocas del Toro is located on the entrance of the Chiriqui Lagoon. It is formed by nine islands, 51 keys and more than 200 small barren islands. It was discovered by Cristobal Colon in 1502 during his fourth and last journey to the New World. The exuberance of the landscape that once amazed the conquerors, is still being experienced by visitors nowadays. The most important migration to the region begins during the XIX century when blacks originating from the United Stats and Colombian Islands of San Andres and Providencia arrived as slaves of rich landowners, mixing themselves with natives and establish small communities of fisherman and agriculturists. The banana industry was at its peak by the end of the XIX century with the establishment of the United Fruit Company. For the most part, the culture was focused in the costs of the Chiriqui Lagoon, but the Island of Colon was the heart of this activity. The culture of banana became the main economical activity of the area. In the present, the population of the province consists of mostly natives with Creoles that speak English, Chinese and chiricanos. The Creoles are descendants from black protestants. Their language is guariguari, a mixture between African and Antilleans English, ngobe, Spanish and French words. The guariguari is also spoken in Colon and Panama, but without the contribution of ngobe bugle and with Jamaican slogans. The inhabitants of the province live mostly in Changuinola, Almirante and Bocas del Toro. The majority of the natives live in remote areas and in communities that practice subsistence agriculture. The most important group is Ngobe Bugle (35%) also called Guaymies, located in the central part of the province. They culture the land, work in banana plantations and speak Ngobere. Also, there are three other minority groups of natives. The archipelago consists of six big islands and some small ones. The biggest island is Colon, followed by Popa Island, Bastimentos Island, Cristobal Island, Cayo de Agua and Cayo Carenero. The Colon Island is the most developed island of the archipelago. It is the location of the town of Bocas del Toro and it is also the capital of the province. There is a great number of hotels, restaurants, recreation centers and facilities for the ecological tourism and adventure. 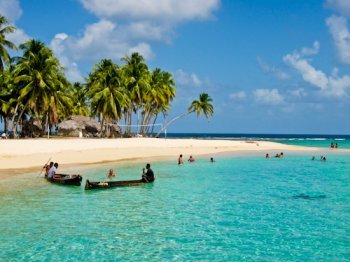 Bocas del Toro has generated a lot of interest in recent years and this can be reflected in the increase number of tourism to the area, most notably from Europe. It is very common to see Germans, French, Dutch, Italians and north Americans walking around the town. Night clubs offer a cosmopolitan environment where everyone joins in and parties seem to last all night. Real estate in Bocas del Toro has also been growing steadily with the developments of projects such as Red Frog Beach. It is easy to travel to near places from this island, where you can enjoy white sand beaches and palms, sun baths, swim or enjoy marine diversity by practicing scuba diving. One of the most typical characteristics of Bocas del Toro is the architecture, a reflection of the influence made by Caribbean immigrants as well as the United Fruit Company. There are several styles that still prevail in different towns, like wood houses made of imported “pinotea” protected by mosquito nets and surrounded by gardens, which show an north American style adapted to the tropic. Another style is visible on houses from the same material, over piles, imitating the ones built for the workers and others are a portrait of the French camps from the time of the construction of the Canal.